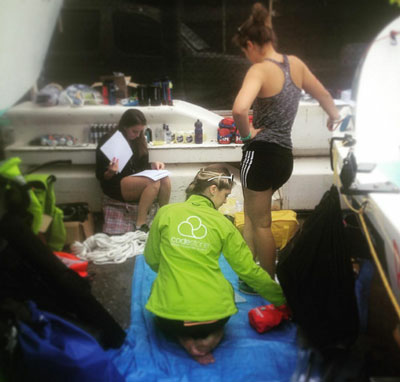 As we approach the 15th December, the date on which four young ladies set-off on their challenge to row the Atlantic – we thought we would share an extract from blogs posted by the girls answering some of the common questions they are being asked. 1. CAN YOU SEE THE OTHER CREWS DURING THE RACE? Sadly there will be no rowing along-side each other, merrily exchanging sea shanties and hurling bottles of rum from boat to boat. Naturally the fleet sets off together from the start line, but it won’t take long for the crews to disperse… As soon as it gets dark on the first day, the tiny navigation lights of each vessel twinkle and then vanish off into the night. With a different baring plugged into the auto helm of each boat, and with varying weather and currents influencing the progression of the fleet, within a matter of hours the boats head on their different courses. 2. WHAT ARE YOUR TACTICS TO BEAT THE OTHER CREWS? Each crew will sit down together in La Gomera and decide on their baring to the Caribbean… the course plotted being largely based on weather predictions. It appears there are 3 common routes: A ‘northerly arc’ (as if one were to draw a line from the Canaries to Antigua, bending a few hundred miles above the equator). A ‘southerly arc’ dipping below La Gomera and following the line of the equator. Or a more ‘direct route’ can be chosen forming a straight line. Rowers often aim 100 miles south of La Gomera to pick up the stronger trade winds and prevailing currents. 3. CAN YOU CONTACT FRIENDS AND FAMILY BACK AT HOME? Yes, with thanks to our key technology partner Codestone, we have many gadgets and devices that enable us to touch base with shore. We will take 2 ‘Iridium Extreme’ satellite phones, one to contact race officials, weather forecasters etc. The other is for more ‘social’ calls with families, our charity, media & press etc. We will also take a Macbook Pro on board, enabling us to email and ‘surf’ wirelessly through a Red Box device that acts as an onboard WiFi Hotspot. Through this magical box we gain 3G, WiFi, satellite broadband and can also create an electronic record of our position via an inbuilt GPS tracking system. We will also have with us a standard VHF radio built into the boat, this is mainly designed to communicate with coastguard stations and other vessels at sea. 4. HOW BIG ARE THE WAVES EXACTLY? I get the impression we might be faced with pretty big stuff out there. It is said that the swell size can scale up to 40ft… This sounds terrifying, but unlike coastal waves that build quickly in height, creating a steep face of water before breaking, waves mid-Atlantic will not pitch in quite the same way (more like a colossal rolling hill that gradually moves our boat up and down). That being said, even waves at sea have a tendency to break, causing boats in the past to roll or flip. 5. HOW DO YOU GO TO THE LOO? There is a bucket… a test of balance I hear, especially when it gets choppy. 6. WHAT DO YOU EAT? Dehydrated ration food… simply add water to a sachet and you have an instant meal in a sort of ‘peanut butter consistency’ (Quote Lauren). For my birthday a couple of friends gave me astronaut ice-cream to eat at Christmas for a treat – just so you all know… all forms of innovative non-perishable food snacks like this are very welcome! 7. WHAT HAPPENS IN A CRISIS? As part of the race requirements, we are expected to sit down and come up with a ‘crisis plan’ for worst case scenarios – everything from ‘man over board’ to loss of limbs etc. Everyone at Codestone is wishing the girls every success; we know they will do well and cannot wait to welcome them back.